Swine influenza, also called pig influenza, swine flu, hog flu and pig flu, is an infection by any one of several types of swine influenza virus. 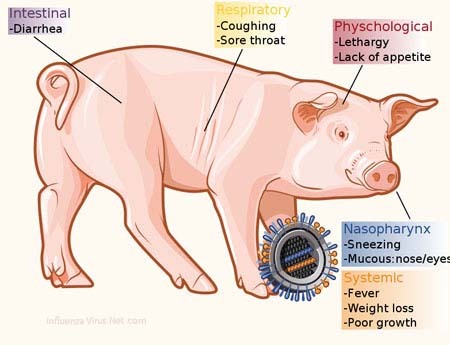 Swine influenza virus (SIV) or S-OIV (swine-origin influenza virus) is any strain of the influenza family of viruses that is endemic in pigs (see figure 1). As of 2009, the known SIV strains include influenza C and the subtypes of influenza A known as H1N1, H1N2, H3N1, H3N2, and H2N3. Figure 1. Swine flu symptoms. Swine influenza was first proposed to be a disease related to human influenza during the 1918 flu pandemic, when pigs became sick at the same time as humans. The first identification of an influenza virus as a cause of disease in pigs occurred about ten years later, in 1930. For the following 60 years, swine influenza strains were almost exclusively H1N1. Then, between 1997 and 2002, new strains of three different subtypes and five different genotypes emerged as causes of influenza among pigs in North America. In 1997–1998, H3N2 strains emerged. These strains, which include genes derived by reassortment from human, swine and avian viruses, have become a major cause of swine influenza in North America. Reassortment between H1N1 and H3N2 produced H1N2. In 1999 in Canada, a strain of H4N6 crossed the species barrier from birds to pigs, but was contained on a single farm. The H1N1 form of swine flu is one of the descendants of the strain that caused the 1918 flu pandemic. As well as persisting in pigs, the descendants of the 1918 virus have also circulated in humans through the 20th century, contributing to the normal seasonal epidemics of influenza. However, direct transmission from pigs to humans is rare, with only 12 recorded cases in the U.S. since 2005. Nevertheless, the retention of influenza strains in pigs after these strains have disappeared from the human population might make pigs a reservoir where influenza viruses could persist, later emerging to reinfect humans once human immunity to these strains has waned. Swine flu has been reported numerous times as a zoonosis in humans, usually with limited distribution, rarely with a widespread distribution. Outbreaks in swine are common and cause significant economic losses in industry, primarily by causing stunting and extended time to market.